The founder of the local Iowa City Moms Blog is opening a coworking space downtown after years of organizing community events for stay-at-home parents. Located in the Paul Helen Building at 209 E Washington St, above Java House, the coworking office aims to provide a space for entrepreneurs and stay-at-home workers to develop their businesses and network with the start-up community. The office is open for work Monday, Feb. 4, and a grand opening is scheduled for an undetermined date in March. As information technology advances, more and more people are working remotely and coworking spaces are popping up as an alternative to working from home or at coffee shops. From 2012 to 2016, the number of people working remotely in the United States increased by 4 percent points from 39 to 43 percent according to a Gallup survey. 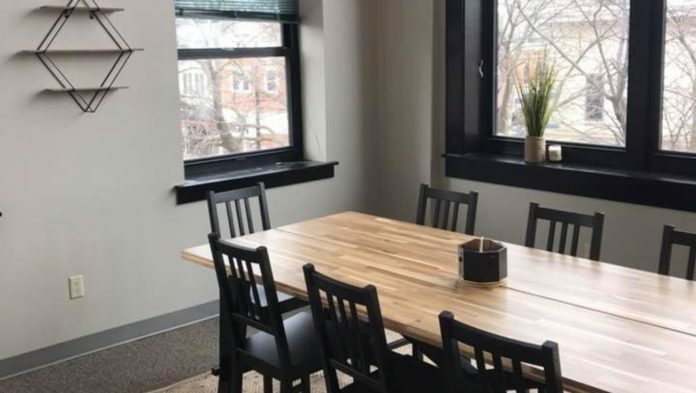 Nancy Bird, executive director of Iowa City Downtown District, sees the collective as a creative use of space and an opportunity for stay-at-home entrepreneurs to be seen by the public. The Cowork Collective isn’t Iowa City’s first coworking space. Merge, located in the pedestrian mall, opened in 2017 and offers conference rooms and desks for daily and long-term use. What makes the collective different from Merge is how it came into being, Bird said, with the growth of Meehan’s local edition of the national City Moms Blog network. “She’s been a champion for women’s groups,” Bird said, emphasizing the niche Meehan is focusing on. Meehan co-founded the blog in 2013 as a way to bring moms together through the daily challenges and perks of staying at home. And after years of setting up meetings at local coffee shops, home offices and other coworking spaces, she felt the Iowa City Moms Blog community needed a location of its own. She said the idea was jump started after visiting COWORKQC in Davenport. “I worked there a few times and loved the atmosphere,” she said. Meehan then started looking for spaces that wouldn’t just accommodate the blogging team of four employees and 32 contributors, but other entrepreneurs as well. At its location on E. Washington Street, the collective has three offices, one conference room and a shared workspace with desks. Two of the offices are already rented out to businesses and she’s sold several memberships. Renting an office costs $500 a month and memberships vary. Additionally, a conference room and mezzanine level will be available for rent for special events. So far, Meehan said the collective booked reservations for web design, marketing and architecture companies in addition to local artisans and a lawyer.